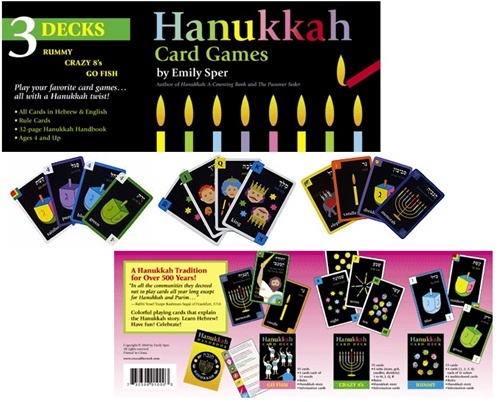 Three decks of colorful playing cards are a fun and educational way to celebrate Hanukkah: Go Fish (Hanukkah words), Crazy 8’s (numbers), and Rummy (colors). All cards are in Hebrew and English with Hebrew transliteration. 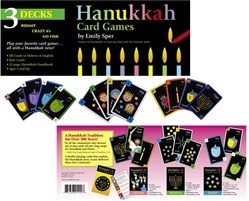 Extra cards in each deck with rules, Hanukkah story, Hebrew pronunciation, and supplemental information. 32-page full-color Hanukkah Handbook includes the Hanukkah story, how to play dreidel, latke recipe, and Hebrew language basics. Play multiple games with each deck! Each set is packed in a sturdy, shrink-wrapped gift box. Quality is alef-alef . . . your satisfaction with production quality is guaranteed.